Newly-elected Sangguniang Kabataan (SK) officials all over the Philippines are required by law to attend the training and orientation before they can assume the office. The Sangguniang Kabataan Mandatory Training (SKMT) was conducted to orient the SK officials on Republic Act No. 10742 or also known as the Sangguniang Kabataan Reform Act of 2015, and to elicit meaningful participation of the youth in local governance and nation building by inculcating patriotism, nationalism, and other desirable values. The training and orientation has five (5) modules: 1. Decentralization and Local Governance, 2. SK History and Salient Features, 3.Meetings and Resolutions, 4. Planning and Budgeting and 5. Code of Conduct and Ethical Standards. SKMT of the SKs from the 14 municipalities and 3 cities in Misamis Occidental were divided by the Department of Interior and Local Governance (DILG) Provincial Office into four (4) training venues with 2 venues here in Misamis University, others were in Tangub City and in Oroquieta City. SKMT was held last May 17-26, 2018 with the total participants of 1, 692. The MU Auditorium served as the venue for the participants from the municipalities of Aloran, Panaon, Lopez Jaena, and Plaridel, while the MU Function Hall was the venue for participants from municipalities of Sinacaban, Clarin, Tudela, Jimenez, Lopez Jaena and Panaon. Below, during the registration of participants and distribution of training kits: Ms. Yunalyn L. Villantes and Ms. Hanzen D. Tomatao with Ozamiz City LYDO Ms. Joan Pactolin. Above, MU CAS Dean Atty. Anthony L. Awa discussed Decentralization and Local Governance, while MU AQMR Ms. Nelpa N. Capio discussed Code of Conduct and Ethical Standards. Below, DILG Provincial Director Mr. Pablio Benitez discussed Planning and Budgeting, as well as on Meetings and Resolutions. Below right, Facilitators Ms. R. P. Galindo giving the overview of the SKMT, and lowermost Facilitator Mr. N. Anasco from DILG . 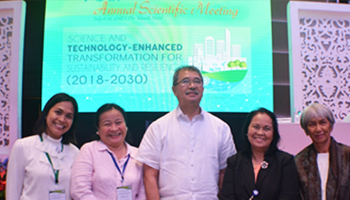 The training was facilitated by knowledgeable and competent speakers from the academe, government agencies, and representatives from the aforementioned city and municipalities. The speakers who imparted expertise on 5 modules of the training from the DILG were DILG Provincial Director Pablio Benitez Jr., Mr. Neil Anasco- and Local Government Operations Officers from the Cities and Municipalities (LGOOs) : Mr. Richard Guillen from Ozamiz City, Mr. Joel Jose Tabil from Panaon, Ms. Jenny Villagonzalo from Aloran, Ms. Emelyn Maglangit, from Pana-on, Mr. Diogracias D. Romero Jr from Lopez Jaena, Harold Buscaino from Lopez Jaena, Mr. Rey Guilbert Capricho of Plaridel and Mr. Edgel Vedra- MLGOO of Clarin. Local Youth Development Officers (LYDOs) also joined: Mr. Raymund Butalid- LYDO of Clarin, , and Ms. Josephine Quilo, LYDO of Jimenez. Ms. Lorelie Cagas, Manager of MOAP and Ms. Lorraine Anasco, have also shared their expertise on the module. The resource persons from Misamis University were Atty. Anthony L. Awa, Dean of College of Arts & Sciences, Prof. April Farell M. Relacion- Faculty of College of Arts and Sciences, Prof. Nelpa N. Capio- Faculty of MU Graduate School and Asst. Risk Manager, Mr. Joey Cabrera- Director of Student Affairs and Guidance Council Office, and Prof. Rodel Baldado, faculty of College of Arts & Sciences. The training team who made this event successful was composed of faculty and staff of Misamis University and representatives from the LGUs. The Training Managers are Mrs. Grace V. Villanueva, Director of Misamis University Community Extension Program (MUCEP) and Mrs. Yunalyn Labajo- Villantes, faculty of MU College of Arts and Science and a MUCEP staff, while Ms. Russel P. Galindo also of MU College of Arts and Science was one of the Facilitator . The training documenters were Mr. Eden Pito and Mr. Bobby Alaman- MUCEP staff and the secretariat members were MUCEP staff Ms. Hanzen D. Tomatao and Mr. Jerson A. Celo, Ms. Joan Pactolin- LYDO of Ozamiz City, Mr. Jingle Tampoog- LYDO of Tudela, Mrs. Heidi Dela Cerna- staff of DILG Provincial Office and Mr. Lyvanne Yubero, LYDO of Aloran. Above: MU CAS Prof. April Farell Relacion discussed the topic Decentralization and Good Governance. He encouraged the SK officials to spearhead in making the youth as partner of government in nation building and explained the characteristics of good governance, while MU DSA Director Joey Cabrera emphasized Code of Conduct and Ethical Standards. Below CAS Professor Mr. Rodel Baldado recapped the SK History. Below, right the participants during the workshop. Above: Training manager MUCEP Director Grace V. Villanueva setting the house rules, while on the right is Ms. Evanessa Q. Pasamba, the Cluster Head of Northern Mindanao of National Youth Commission visited the SK Mandatory Training Batch 9 last may 26, 2018 at Function Hall, Misamis University, Ozamiz City. She emphasized that now is the time for the new SKs to prove that the youth is indeed the hope of our country, she also said that the DILG , NYC and LYDO will support endeavours of SK . Below, photos of participants and their outputs during the training. Misamis University President Dr. Karen Belina F. De Leon has always been very supportive of the programs and projects of Misamis Occidental, and allowed the faculty and staff to facilitate the training of the newly elected SK officials. Post training assessment indicated the SKs learned considerably about their duties, obligations and the ethical standards expected of them. Enormous thanks to DILG for the opportunity to serve the youth, and Misamis University President and administration for the support in making the training successful. My MU. My HOME. My FUTURE.